The Powerhouse website and online word association archive have been updated several times over the years. A digital copy of the twenty-minute time-lapse film Powerhouse, which documents the process of creating the entire word composition with an additional spoken soundtrack (from the first word Powerhouse to the last word Albatross), was donated to Cambridge University Library in 2008. However the library had no means to secure the preservation of digital formats at that time, and this remains an issue. Two text images were also created - and printed on paper. One poster shows the entire word composition as a colour-coded narrative. The other poster gives the first, last, and most often displayed words, creating a more enduring portrait of the library. One year after the live event, I am delighted to add as a contribution to this website the complete short story Powerhouse by Benjamin Morris (see link on the right). It incorporates the entire word association chain and follows a trail of desire and unexpected events during a busy opening night in the Turbine Hall of Tate Modern, another building by Giles Gilbert Scott. The story imposes a new level of meaning to this project by further distorting, and turning inside out, the fabric of the University Library. We are still working on the film Powerhouse. Tim Sidell has edited footage of 8,000 stills into a 15 minutes high definition time-lapse sequence, documenting the changing word display in the library. Nicholas Ryall is working on the sound track using spoken word. I will explore ways in which the film can be shown at the library, once completed. The Powerhouse word association game spiralled to a barely controlled conclusion with the final word Albatross displayed on Friday 13th June, 9pm. In total 483 words were displayed over the 53 days of the Full Easter term, starting with the word Powerhouse. 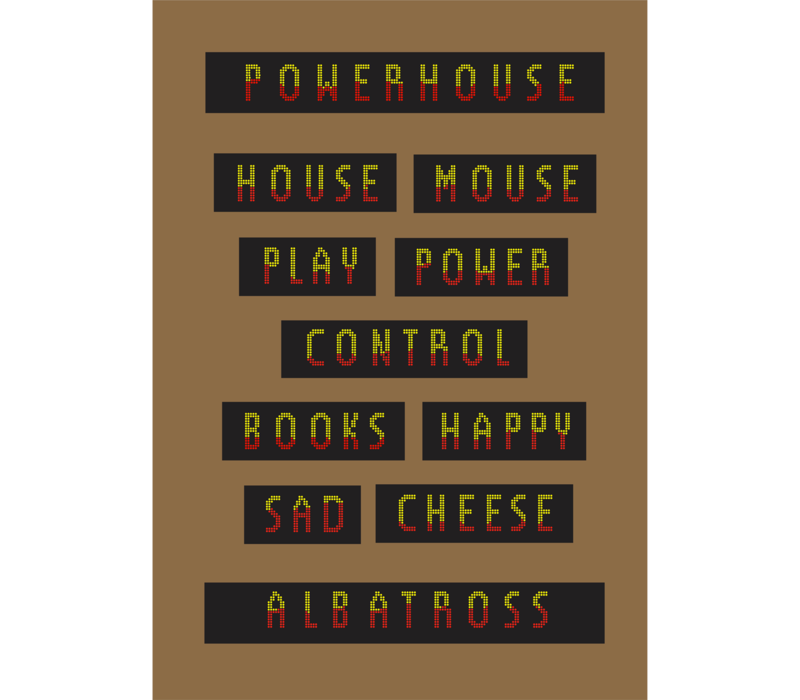 The words most frequently displayed in the library were: House, Mouse and Play (4 times each), followed by Power, Control, Books, Happy, Cheese and Sad (3 times each). The words most frequently submitted and displayed were Aardvark (30 entries, displayed twice) and House (29 entries, displayed 4 times). To follow the full story, see the word association index (link on the right). Please look out for future contributions on this website. The second instalments of fiction based on the Powerhouse word sequence by Benjamin Morris and Bradon Smith are due next, as well as an analysis of the words by Ruth Abbott. It is also intended that a short time-lapse film will be made. 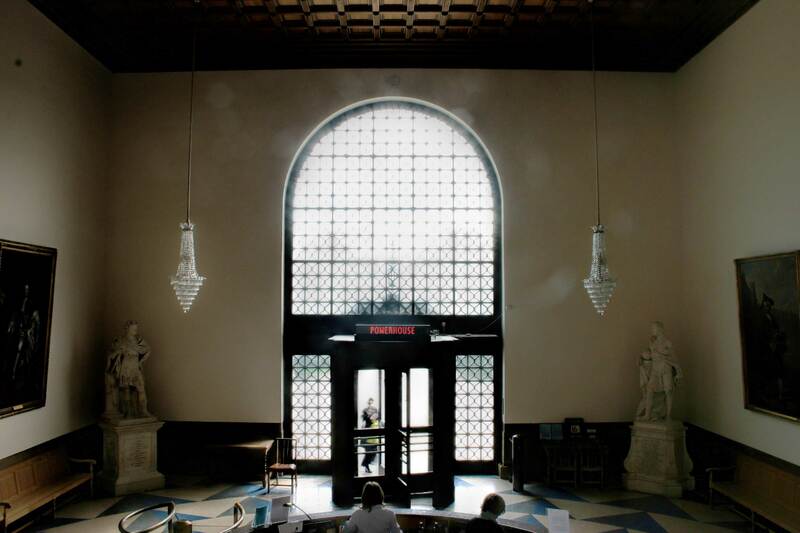 I would like to thank all at the University Library who made me feel welcome, and who have become friends. A final big thank you goes to the players who participated and helped to create this unique account. We are pleased to add to this website a new contribution of fiction by Bradon Smith, based on the 'Powerhouse' word sequence, using one word per sentence (see link on the right). In the first instalment of 'Play' we meet poker-player Nick and suspect his past is about to catch up with him. Exactly in which way, even the author does not know, as the story is written in real-time and determined by the word associations yet to come up during the final two weeks of the game. So far nearly 400 words have been displayed in the library. The final word will be up 9pm on Friday 13th June. We are proud to present the first instalment of 'Powerhouse', fiction by Benjamin Morris, as the first of scholars' contributions (see link on the right). Morris writes in real-time and uses one word of the association sequence per sentence in a literary-experimental collaboration with Bradon Smith. 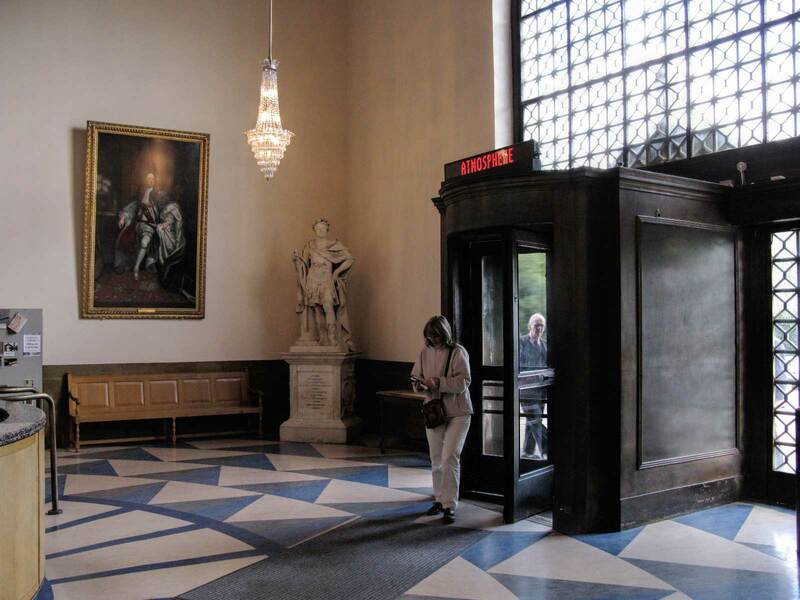 The story transports us to the scene of a blind date at the Tate Modern, another building by Giles Gilbert Scott, architect of Cambridge University Library (and, incidentally, designer of the iconic red telephone box). Having reached the halfway point of this project, 61% of over 5,000 submissions have been made by women. Subsequently, of the displayed words, which originated on-line, 69% were entered by a majority of women,14% by a majority of men and 17% submitted equally by both genders. The most frequently entered and displayed words were goodbye (27), happy (26) and player (25), followed closely by the words: me (20), high, house, god and mouse (all at 19) and next: power, mine, bungle and game (all at 16). Which, surely, covers a lot of ground! The LED display in the Tea Room has now arrived, which gives the project more visibility. There is also a new graphic animation at the top of the word associations page. Each word, displayed to date, is represented on a time-line by a coloured dot. When hovering over a dot, white lines connect with other instances where the same word occurs (see index). We have struggled with some bleached, unreadable, images taken when the outside light is very bright. Hopefully this has been adequately remedied by updating the live images every ten minutes- also through the night. Look out for the first of scholars' responses: we have been promised Oulipo style stories, using one of each of the displayed words per sentence, to arrive soon. Over 3,500 words have been submitted so far; thank you for all of these! The first week of 'Powerhouse' has been an intense and new experience for me. Calibrating the website, camera and LED display with the reality of being 'live' in the Library has led to a few teething problems. Hopefully these are mostly resolved now. We aim to develop the website with a graphic animation of words to date, and hope to set up a little LED display in the Library Tea Room. Thank you very much for all your words so far.